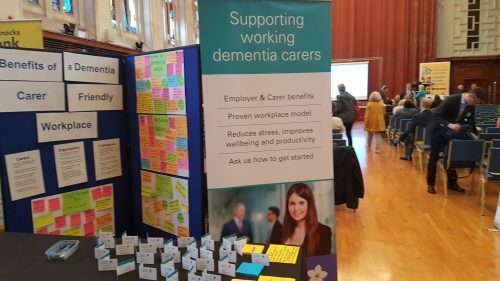 4 Dementia Carers stand. Note the new banner! 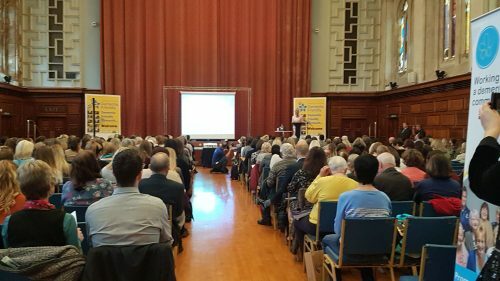 I attended this conference at Plymouth Guildhall on Wednesday March 16th. My new pull-up banner arrived in the nick of time! My stand was in an excellent position by the central gangway at the back of the hall, just as you come in. The event was very well organised and everyone was very helpful on the day. Angela Rippon CBE, Chairperson extraordinaire! Angela Rippon CBE was Chairperson. The image of Angela rushing back and forth (she was very much in demand and very agile), shoes in hand to stop the noise of her heels on the floor disturbing the current presenters, will stay with me for a long time! Miss Rippon was generous enough to give me a few precious minutes of her time to explain to her about my work supporting working dementia carers. I do hope we can be in touch again to discuss further but I know she is an extremely busy lady. 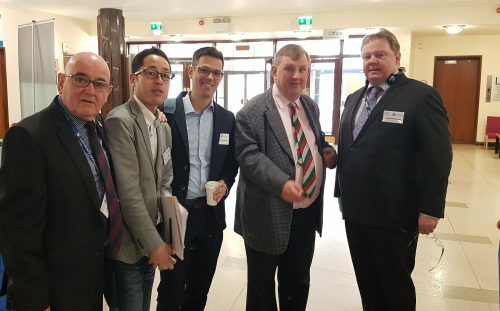 Several nationalities were represented including Italy; Germany;Japan; China and New Zealand. Everyone who took part had a unique insight to share. We enjoyed contributions from primary school children to the elderly. 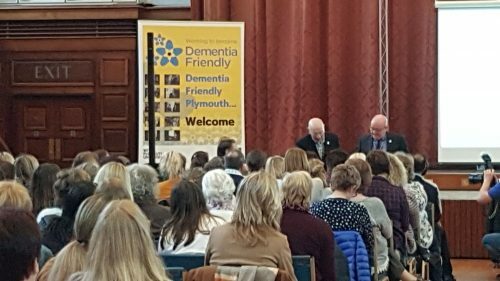 Advice such as ‘Adventure before Dementia’ from an elderly gentleman who has dementia made us all smile. It is good advice and applies whether you end up as a carer or as a person with dementia. David Fitzgerald from Radio Devon told us about his Mum and was interviewing live on air from the conference. Professor George had worked with Ian Sherriff and was obviously a firm favourite with everyone present. He had put the ‘Friendly’ into Dementia Friendly Communities. His own dementia did not prevent him from taking part. Speaking from the floor at the front, (the steps probably too difficult for him to negotiate), I felt a tangible love and support for him in the room. We had superb insight into the crazy world of risk assessments which would stop a person with dementia from spending valuable time outside. Balancing risk against benefits seemed a very practical and long overdue approach. Farms as a Place for People Living with Dementia is a project we could all learn from. Required safety equipment consisted only of wellies. People with dementia with no farming background would love to go there! 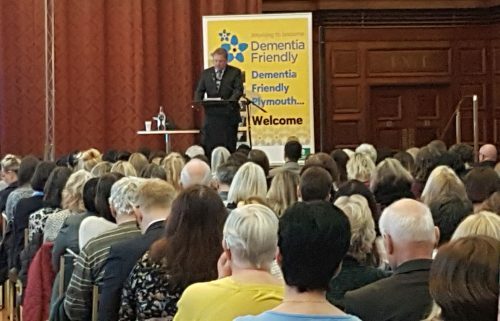 Speaking to delegates who had been or were currently an informal dementia carers, I asked them to write down on Post It notes what stressed them. This generated a fair amount of enthusiasm and some great feedback which I have shared. It is exactly the kind of thing which helps others understand dementia carers and helps dementia carers to feel less isolated as they see others have similar issues. – You feel sad, angry, helpless. No matter what you do for the person you care for to make their life a little happier it never seems to work. My Mum was a very independent strong woman who made her own decisions in life and now lives in a shell and is so angry and aggressive. She will not let us help her feel any better. She does not know us. I never wish for anyone to feel as helpless as we do as a family. We lost the Mum we loved in 2012, but we can see the lovely person in front of us but it is not her. – As a carer for my Mum who is in a care home. Not knowing how she will be today. Not knowing how to make her smile. Not knowing what is the right or wrong thing to say. Should I take in photos? Will that make her happy or sad? – Will I be able to cope with caring for Mum in the future? Fear of unknown. – However prepared for dramas you are there’s always another drama that jumps up and surprises you! This has had, or is having, an impact on your life and/or wellbeing; and You are not, or have not been paid to give care. and You are not, or have not been paid to give care. The dementia does not have to be diagnosed – and the person does not have to live near, or with you.